– Remove all diseased leaves, fruit, branches from plants and remove all obvious diseased plant parts from the soil and mulch. This is especially important in food gardens as you need to reduce the amount of disease spores from the area. DO NOT place these parts in a compost pile unless it is an active pile that reaches 140° F.
– Weed. 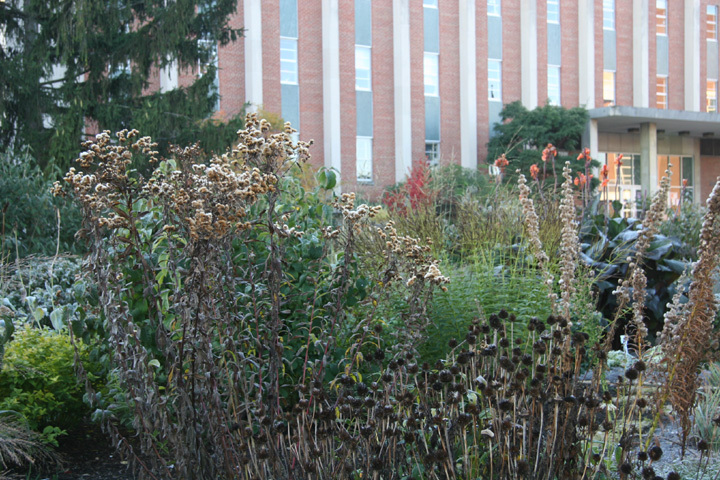 Many annual weeds take advantage of cooler temperatures and fall rains. They produce seeds for the weeds of late winter and early spring. Get a head start on eliminating late sprouting thistles and dandelions as you walk around the garden, enjoying the fall weather. I find a cup of tea (morning) or a glass of wine (evening) to be a nice addition. – Plant bulbs! 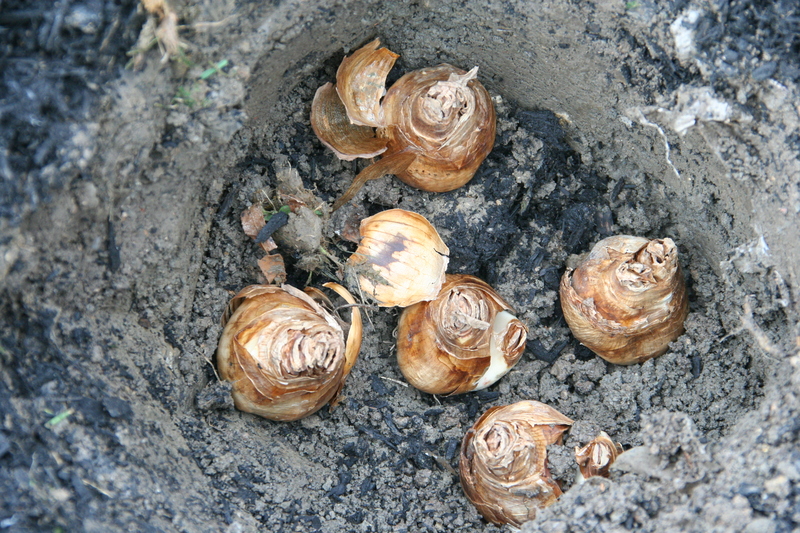 Depending on your location, you could plant bulbs now, but I like to wait until after October 1st. Extended or late Indian Summers can cause your bulbs to send up leaves. This takes precious energy from the bulbs. How late can you plant? One year I planted bulbs on December 24th and they still bloomed, but I would not recommend this as a yearly practice. – Pile your leaves in an area that will become a garden. Fall is a great time to start a garden bed. Lay newspaper or cardboard down first and then pile the leaves on. If you collect grass clippings, add that in – although, grass clippings are best left to feed the lawn. 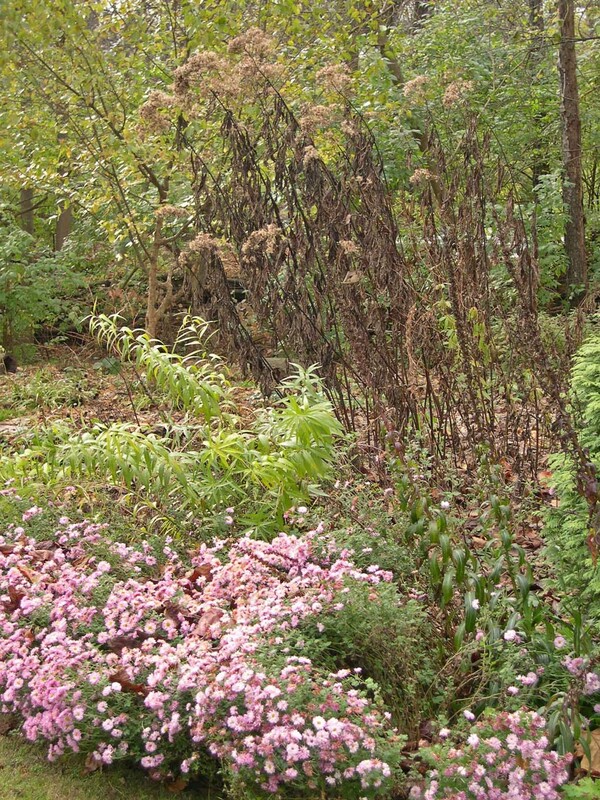 – Consider leaving leaves in your more naturalized beds. – Add leaf or mushroom compost, 2-3” thick and 3-4” from trunks and crowns, to beds where the soil is bare. – Take an inventory of what worked and didn’t. This will be invaluable for when you plan next season’s garden additions and subtractions. – Prune trees and shrubs. Once the leaves drop you can see crossing and broken branches, and structural problems that need to be corrected. – Plant trees and shrubs as long as the ground can be dug. – Edge your beds and get a jump-start on spring maintenance. – Remove all the mulch from an area and bare the soil. 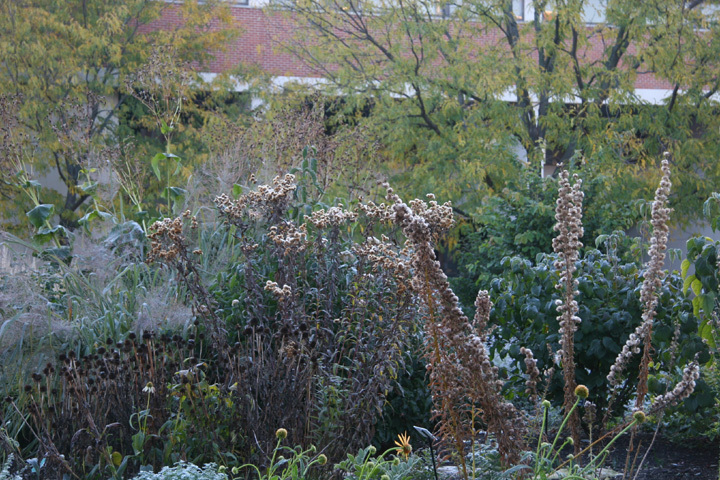 – Remove seedheads that provide food for birds in the winter: purple coneflower (Echinacea), goldenrod (Oligoneuron), asters (Symphyotrichum), false sunflower (Heliopsis), Joe-pye weed (Eupatorium) and more. – Cut your herbaceous perennials down to the ground. Exposed crowns are more likely to freeze in the winter. If you cut down plants, leave some of the stems to provide a windbreak. This year, late blight decreased my tomato harvest and of many gardeners in Ohio. I have watched it creep (jump?) across the Midwest and have noted reports of infection in Indiana and Wisconsin. Along with removing diseased plants and destroying them or segregating them, you need to move your tomatoes to another location. Next year, make sure your tomatoes are as healthy as they can be with appropriate fertilization and watering practices. This year I am going to put fresh chicken mature on the area where my tomatoes were. I am hoping this “hot” manure will decrease fungal and bacterial spores in the soil. This may – or may not – reduce the inoculum of late blight, but it will certainly increase the fertility for other food plants I intend to grow in that space. Another approach is using clear plastic to solarize the soil. The best time to solarize soil is in the summer, but you may be able to catch some hot fall days or wait until the first weeks of May. This is done in Florida to reduce nematodes. As you can see from the above list, most of this is optional and if you get really busy, just think… you can do it all in the Spring!